A circular economy aims to decouple economic growth from the use of natural resources and ecosystems by using those resources more effectively. By definition it is a driver for innovation in the areas of material, component and product reuse, as well as new business models such as solutions and services. 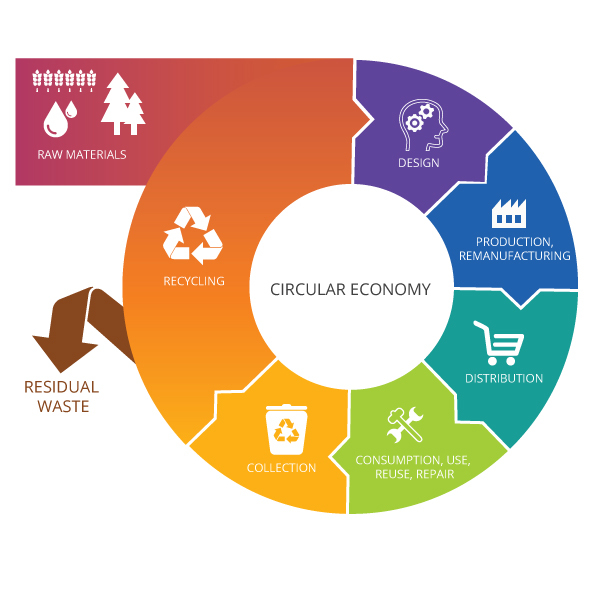 In a circular economy, the more effective use of materials enables to create more value, both by cost savings and by developing new markets or growing existing ones. A circular economy is a practical solution to the planet’s emerging resource deficiency. Reserves of key resources such as rare earth metals and minerals are diminishing, while exploration and material extraction costs are rising. The current ‘take-make-dispose’ linear economy approach results in massive waste which intern is harmful to our environment –, 90% of the raw materials currently used in manufacturing become waste before the product leaves the factory while 80% of products made get thrown away within the first six months of their life! A working circular economy could be a practical solution to the planet’s emerging resource problems and go a long way to helping improve the global environmental issues.